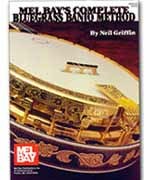 One of the very best G tuning five-string bluegrass banjo methods available! The book teaches how to pick out tunes single-string style (one note at a time), how to play chord accompaniment, and how to play solos in the full three-finger, bluegrass style. Topics include note and tab reading, chord background styles, traditional bluegrass techniques, fills and endings, use of the capo, rolls, slides, hammers, pull-offs, choking, harmonics, and up-the-neck playing. In notation and tablature. The stereo recording includes acoustic bass, acoustic guitar, and a rhythm track as well as the 5-string banjo. All songs and most exercises are included in this teaching recording, performed at a tempo that the student should be able to maintain in short order.